I just love these blueberry muffin bites. Who doesn’t like a blueberry muffin? They remind me of the blueberry muffin larabar. In fact, I used similar ingredients. My daughter loves that flavor, so I thought I would make some for her. I’m sure by now, you know that I love homemade larabars. 🙂 These no bake bites came out so good! Not only are these delicious, but they are very easy to make! 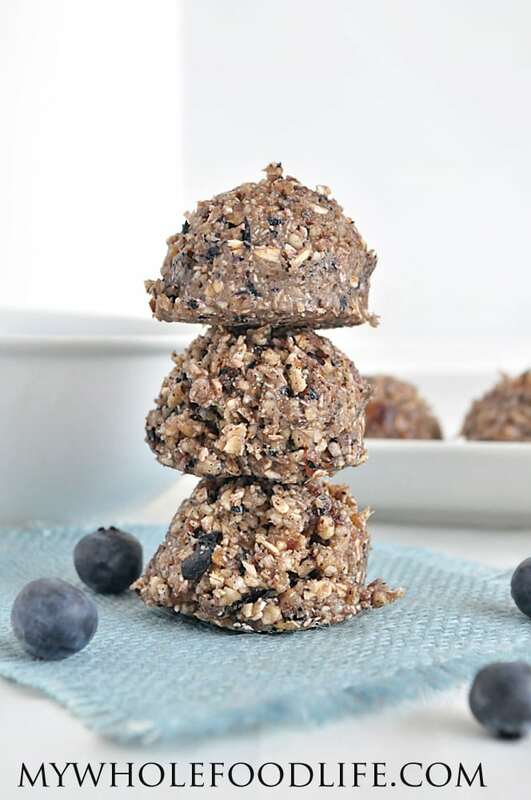 These little yummy, no bake bites are vegan, gluten free, dairy free and egg free. You can probably make them grain free by using all cashews instead of the oats. This recipe is a perfect snack for kids too. 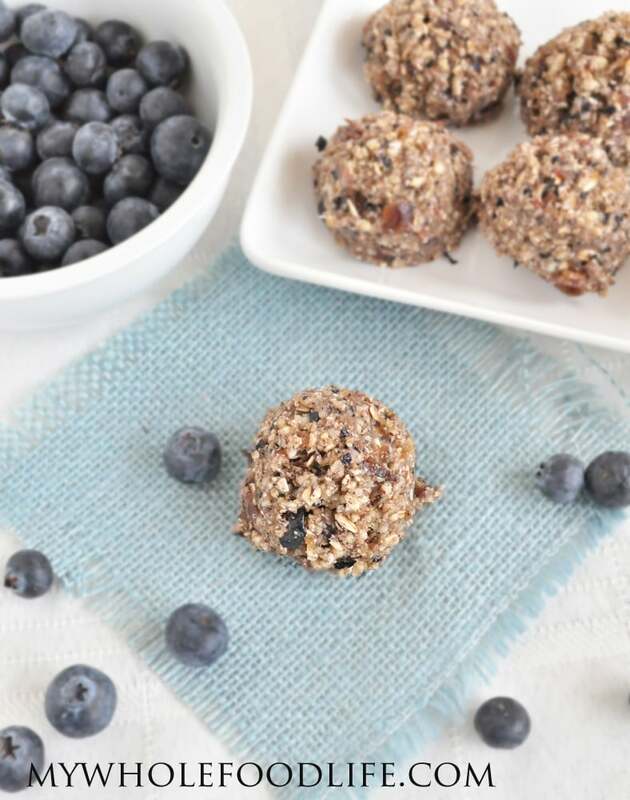 A healthy snack you can make in minutes! In a food processor , combine the cashews, oats, ground vanilla beans and sea salt. Pulse for 1 minute. Then add in the blueberries, dates and lemon zest and pulse for another minute or two until everything looks well combined. Roll into balls and place on a parchment lined baking sheet. I used a cookie scoop to form mine. Stick in the fridge for 30 minutes to firm up. These bites should last in the fridge for at least 4 days. You can freeze them for longer storage. Enjoy! Thank you these look delicious! Going to make them right now! And thank you Janet for posting that about frozen blueberries because I wanted to try but I was skeptical of wasting all my ingredients. I so appreciate this blog! :-) The only thing that didn't turn out for me with the Marygon crackers. I didn't according to the recipe of mine didn't get crispy. Thanks Karen! I hope you enjoy them! For the Mary's Crackers, maybe they were not thin enough? Mine were super thin and that is how I got them crispy. You're welcome Kristin! So glad you like them! Looking forward to trying this recipe. Can I substitute pecans or walnuts for the cashews? Thanks Sylvia! Yes I think that should be fine. Hi! This recipe looks great! Just about to go grocery shopping and adding these ingredients to my list. I was just wondering if there is anyway to warm these, or can you leave at room temp? Sometimes my kids have sensory issues with cold food! Either way Im going to love them!! Thanks! I'm wondering what the calorie count is. They are so good, I want to eat more, but worry about overdoing it! So do you have an approximate count per ball if there are 15 balls?